The e-Pulse® Ultra Shoe Combo Package is the ideal starter kit for treating aches and pains throughout the body. 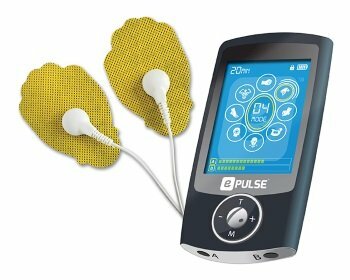 The e-Pulse® Ultra Combo is the ideal starter kit for treating aches and pains throughout the body. It comes equipped with the e-Pulse® Ultra TENS unit, an advanced Neuro Stimulator device that can be used for pain relief anytime, anywhere. It simulates both TENS (Transcutaneous Electrical Nerve Stimulation) and EMS (Electrical Muscle Stimulation) treatments to stimulate both nerve endings and muscles. FDA Cleared TENS and Powered Muscle Stimulator! Get all the latest information on our products, events and sales. Sign up for our newsletter today! ©Copyright 2019 by Enovative Technologies, LLC. All Rights Reserved.